I’ve said it before, and I’ll say it again. One of the best things about being a music blogger is when one of my friends releases a record that turns out to be Fiddlefreak-worthy. Such is the case with the album “Inspired,” a lovely new collaboration from champion Scottish fiddler Rebecca Lomnicky and piper David Brewer, of Molly’s Revenge. Oregon native Rebecca Lomnicky is an award-winning young fiddler whose playing brims over with grace and passion, while David Brewer shreds just about any instrument he can get his hands on (on this record: highland bagpipes, Scottish smallpipes, bodhran, whistles, guitar, bouzouki, and mandolin.) 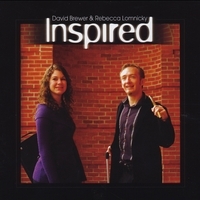 Most of the tunes on this all-instrumental release were written by either Rebecca or David, or both. 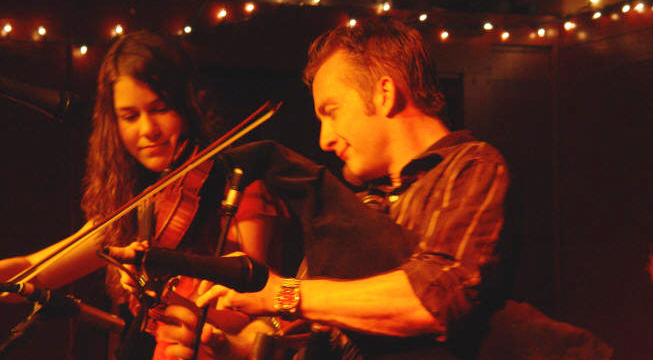 The repertoire here runs the full gamut from grand marches and sentimental airs, to whimsical jigs and raging reels. Recommended for all fans of traditional Scottish music, this record from Rebecca and David is truly an “Inspired” piece of mighty music! With special guests Natalie Haas on cello and Jeffrey Spero of the Syncopaths on piano.